Are you an individual, museum, or community organization that would like to have your exhibit on display at the WDM? The WDM develops permanent, temporary and travelling exhibits for all four WDM locations. Additionally, the WDM borrows temporary exhibits from other museums and community organizations. Exhibit topics are developed in accordance with goals outlined in the Museum’s Strategic Plan and related documents. The WDM maintains a Curatorial Committee responsible for the evaluation and selection of all exhibit proposals. WDM staff, other museums and members of the public may bring forward ideas for exhibits to the Curatorial Committee. 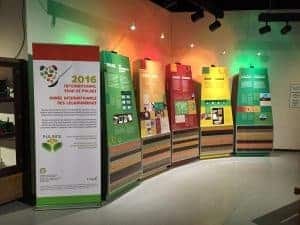 Pulses: The Ideal Partner by the Canada Agriculture and Food Museum. WDM photo. The WDM values partnerships with community groups, however the Museum has a limited capacity for exhibit development. We regret that we cannot pursue all proposed exhibits. Partnership requests and exhibit ideas will be reviewed by the Curatorial Committee. 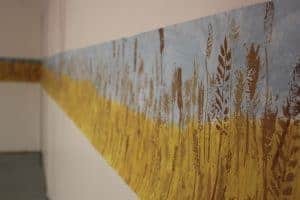 Wheat field mural by Monique Martin. WDM photo. set-up and take down are the responsibility of the exhibitor. Exhibit planning and development is a long-term process. The WDM plans its travelling and temporary exhibits well in advance aiming to have the exhibition schedule in place 2 to 3 years ahead of time. Most community partnerships will take 3 to 5 years from proposal stage to installation in the Museum. We receive numerous exhibit proposals and enquiries throughout the year. The Curatorial Committee normally meets monthly, however due to the volume of submissions, responses may take up to 3 months. Thank you for your interest in working with the WDM.